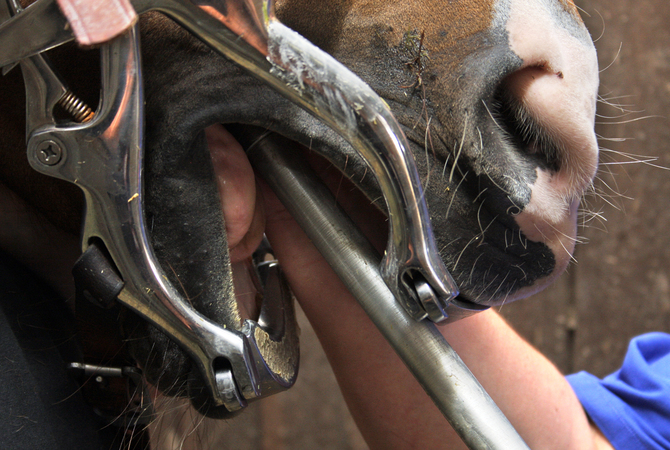 Equine dentist using a full mouth speculum to examine a horse's mouth and float teeth. After a thorough dental exam, the equine dentist will usually follow through with the dental care and work that the examination calls for. In most cases, the equine dentist will go over the problems observed during the examination, give details about treatment and cost of treatment, and answer any questions you, as the horse owner, might have. The most common treatment for equines is the process of floating or rasping the teeth also referred to as equilibration. This procedure should be performed on a routine basis geared to the needs of the horse which may be every 6 months to once a year. The procedure is not painful to the horse and can usually be done with minimal restraint with an assistant holding the horse's head, although excitable horses may need to be tranquilized. Floating corrects minor abnormalities of wear and controls sharp edges and points that develop as the horse chews its feed. Tartar removal is necessary with some horses, This yellowish build-up of organic and inorganic substances that accumulate on the horse's teeth is usually removed with the use of air abrasion, dental picks and other scraping instruments. Individual metabolism or chemical makeup in the horse's mouth will affect how often tartar needs to be removed. Periodontal pocket repair helps keep the horse's mouth, teeth, and bone structure in a healthy condition. When periodontal pockets form, the gums separate from the teeth resulting in mechanical and toxic bacterial damage to the tooth. If not corrected, these infected, bacteria-laden pockets may damage the gums and lead to loss of the tooth. The equine dentist will remedy this problem by irrigating and debriding the affected area using compressed nitrogen, water and aluminum oxide powder along with disinfectants. When necessary, a prescription for antibiotics may be necessary. Although horses usually don't develop cavities like humans do, problems can occur with pits, chips, splits, breaks, and other conditions that compromise the tooth. Bonding agents, epoxies, and restoration techniques are used to correct any damage to the horse's teeth. These repairs prevent tooth loss, fracturing, and cupping problems that affect the horse's ability to chew properly and also prevent problems with bits and bridles during riding and training exercises.